Discussion in 'The Cat Lounge' started by MoochNNoodles, Apr 14, 2019. I keep seeing some really neat handmade blankets shared on Facebook. And one of my old bosses is semi-retired now and using all her leftover yarns to make hats for preemies for her local hospital. They are SOOO adorable! My Aunt crochets like it's nobody's business. I don't think she knows how to sit still and she is retired now so she's making even more things. If she hears someone is pregnant; she's sending a blanket. She even made my DD one while on a Caribbean cruise. She has even sent me home with a blanket for my stepsister that she never met. Last winter we came home with super adorable hats and my kids each had new blankets for their beds. She had already made the kids blankets for their beds that they use year round. They have multiple baby/toddler size blankets they still like too. You just can't beat a handmade blanket! Now that my cousins are busy having babies; she's making sweaters and all kinds of things. But me? I tried. My fingers cramped, my eyes crossed. I won't say I've completely given up learning to crochet; but it's not on my list of things to learn yet. Then I see some of these awesome projects and wish I could. If I lived near my Aunt I'd have asked her to teach me years ago. I learned what I did mainly off books and the internet before YouTube got so helpful. Maybe over the kids summer break I can try again. I just think I would learn it much easier with in-person instruction. I can do some sewing. My Grandma taught me some things on her machine and I took lessons for a few months at a fabric store. So I've used a pattern to sew before; but I wouldn't count on my skills there for anything too fancy. I have made some curtains. I added lining to the curtains for my kitchen windows. I learned to make a quilt via YouTube a few years ago. I have fabric to make a fleece blanket for DD; but I need the time to work on it. I made DS one with satin binding a couple years ago. What I'm not comfortable doing is taking in the sides of dresses. My DD is tall and slender so many dresses need a little help to fit right. Normally I ask my BFF to do those. She makes the cutest vintage/retro styled clothing. It's a natural skill for her and she has her own business. Funnily enough; she doesn't like making home decor stuff like curtains and pillows. I have fabric and more lining set aside to make curtains for our bathrooms but I haven't gotten around to that yet either. One of these days!! I'm a 'late-knitter' but I love it. I don't have anything of what I've knitted as I tend to give it away. Living in the semi-tropics tends to do that to you. But I still have this blanket which looks way more yellow in this photo than it actually is. 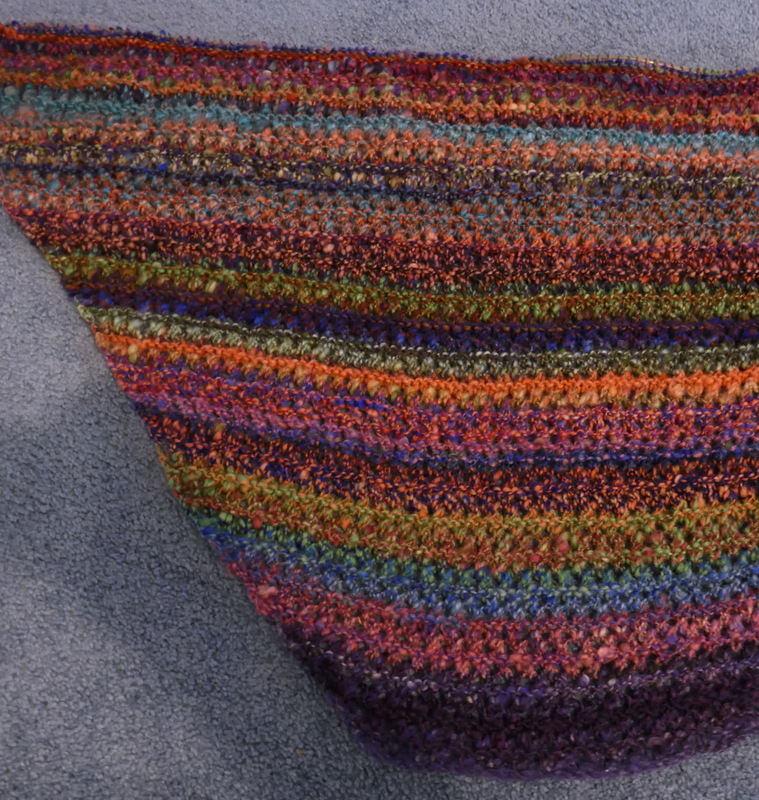 It takes so long to knit a blanket I'm loathe to part with it ... and a shawl I'm currently making for a friend. Sewing is a whole other ball game. I make little bags to put malas in, and do a good job with them, but when it comes to making clothes that fit really well, I get a little scared. DreamerRose, Graceful-Lily, Boris Diamond and 3 others purraised this. No, no and no. I bought one of those teach yourself to crochet books but have yet to open it. MoochNNoodles and Mia6 purraised this. Sewing? Nope. I can barely put on a loose button. My other half sews beautifully, and even makes us matching shirts. He's made curtains, bedding, clothe, tote bags, a purse, and done difficult alterations on clothes. He has a really fancy Babylock sewing machine that does everything but spin the thread and weave it into cloth. His Babylock serger does the rest. He converted a big walk-in closet into a tiny sewing "room" and we share a 12' x 4' conference table for crafts. My mother, godmother, and an aunt used to crochet wonderfully, doing all manner of intricate patterns. I tried, but produced only bad macrame. I don't needle knit, but I loom knit on a circular loom. I mostly make chemo caps for our big cancer center and for friends. I have way too many skeins of yarn, enough to keep me knitting well into the next millennium. DreamerRose, artiemom, Winchester and 3 others purraised this. I tried to sew, crochet and knit when I was in 7th grade and failed big time. Anyway I have arthritis in my fingers now and could not sew, crochet or knit even if I wanted to. micknsnicks2mom, MoochNNoodles and Mia6 purraised this. I learned as a child but can no longer do it because of hand/arm probs. micknsnicks2mom and MoochNNoodles purraised this. MoochNNoodles and neely purraised this. When I was in 8th grade, we had classes called Industrial Arts. They included wood, metal, and print shops. In print shop we each had to make aprons to protect our clothes from the ink. That's where I learned to use a sewing machine and work with patterns. Later, in basic training, I made money sewing buttons back on uniforms for guys who couldn't do it themselves. Knit or crochet? Not so much. I learned to knit and crochet as a pre-teen from my neighbor's grandmother. I like knitting better and I'm trying to rekindle my crafting skills once again. I can crochet and sew. I tried but never could handle two knitting needles. My grandmother tried to teach me to knit. It didn’t go well. I tried to make a dress in high school and sewed the sleeve to the inside. I once sewed a shirt to the leg of my blue jeans because I was using my knee as a platform to sew a button on the shirt. I have made lots of curtains and Roman shades, though, because it requires only sewing in a straight line. I look at it more as a design and math project rather than a sewing project. I have no patience whatsoever with a needle (unless I'm closing a filled pork chop). When I was much younger, my grandmother tried and tried (in vain, I might add) to teach me how to knit. My Home Ec teacher tried to teach me how to sew; I can sew a button on a shirt and I can sew a semi-passable hem. That's it. Yes, I can do all three. Part of being a country kid is you went to 4H and as a girl learned to sew, knit, and crochet. I prefer knitting to crocheting and have made throws, sweaters and other stuff. In the last few years though I have made a number of fleece throws which are crocheted around the edges. Sewing is my part time business. I make and sell washable covers for Swiffer Sweepers online and at craft shows. I was only ever to knit one thing- a typical scarf, and it has been years since! And failure at crochet. I did used to sew a lot though, primarily historical costumes. But again it has been awhile since due to being more busy with everything else. Plus, I wanted to keep it as a hobby under my own freedom and enjoyment; I've been asked to do some stuff for local theater or to sell for plenty for individual folks, but it was a lot and scaled back from it all. And especially for the local theater, they wanted me to make and provide costumes for free through volunteer :/ aside being given free tickets for the season, which was only for two shows anyway. Maybe if I was retired and/or didn't need the money suuuure but no dice in this case! I have bills to pay and not spending a month or so of my free time full time working on costumes and their accessories for free. If you can pay your professional actors and staff surely you can consider forking over a little bit for outfits. I don't think people realize how much work and time it really is to sew sometimes, especially a full outfit, and even more so if it was something as big as a noble Renaissance or Rococo gown, or something else like a comic book character. It got really annoying especially if they got miffed by how much it would cost! Well DUH people! Mother Dragon and DreamerRose purraised this. I can not and wish I could. Knit or crochet; not interested in sewing. I don't know anyone that does that live close enough to teach me. All the people I know who can live nowhere near me. The only classes I can find are all at times geared for the non-working person; early mornings, in the middle of the day or early evenings. Please. I leave home at 6:15 am and don't get home until 6:15 pm. I would bet there are You Tube videos that could teach you. I can knit, crochet and sew, but I never do it and I don't like it. Shame on me ... sewing was my mom's fulltime job during most of my childhood and she liked knitting as well. Yes, but having someone show you in person is certainly better. It's a craft - I'd think a hands on approach with someone being able to show you if you are pulling too tight or loose is going to get better results. Maybe I'm wrong but I think I'd learn better not looking at a monitor. I'd like the personal interaction. I can do all three as well. I used to knit sweaters, but it's hard to knit them to fit correctly. 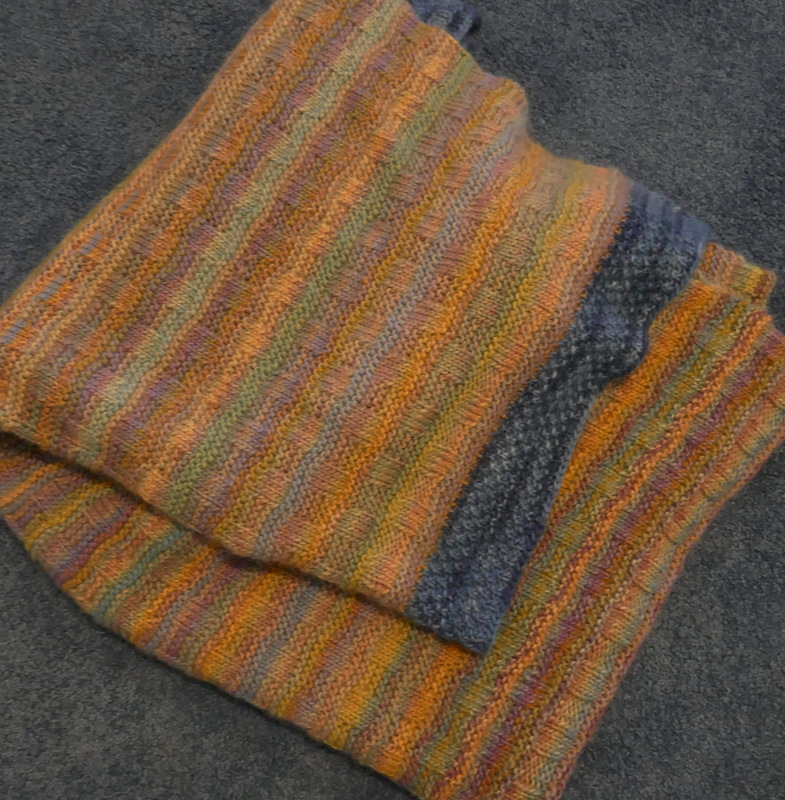 In the past few years, I've knitted mufflers, hats, ponchos, and a prayer shawl for church. That took forever. I knitted so much I don't have anything left to give to someone. I have lots of yarn around and would knit the caps for preemies, but can't find an organization that will take them. I love to knit while watching TV. I learned to crochet a few years ago, but never finished anything. Again, it's hard to get the garment to fit. I used to sew all my clothes. I learned to sew when in high school because ready-made clothes were expensive, and I could make them for about 40% of the cost. It does take a long time to make something and about 40 years ago, ready-made clothes became cheaper, so there was no incentive. I sewed a lot of clothes for my boys when they were toddlers. The friends I have who sew make pillows, drapes, bedspreads, and quilts. Nobody makes clothes anymore.